Oriental Rugs are beautiful, timeless and can complement the décor of a room in the perfect way. But they are also the most delicate flooring choice and very expensive as well. Which is why they need proper care and cleaning or they can get damaged. Regular cleaning and proper care can make your rugs last a lifetime. But you should only trust them with expert Oriental Rug Cleaners in Philadelphia, who clean your oriental rugs with the utmost care. Here are 5 reasons to convince you why getting your oriental rugs professionally cleaned is a good idea. You must frequently vacuum your oriental rugs to keep dust building up on it. Especially if you live in an area with a lot of traffic or there is a construction site nearby. However, not all the dust gets removed by just vacuuming. That’s where you need Professional Rug Cleaners in Philadelphia to come in with the proper equipment and remove the dust and debris from the rug. Professional cleaning method involves putting a lesser strain on the rugs than the traditional method of shaking and beating does. It is possible that you try to clean your oriental rug with a chemical that reacts with the dyes used in the material your rug is made of. Or you over wet the rug and the color starts to bleed. Professional Rug Cleaners in Philadelphia use cleaning materials that are industrially tested and meant for this very purpose. After washing, the rugs are fluff dried to prevent any color bleeding further. Some stains are tougher than others and some may go unnoticed until a guest points it out. If you try to clean these stains with everyday materials that you use for soft fabrics or laundry, you will be disappointed. Getting your rug professionally cleaned ensures targeted stain removal with industrial grade cleaning materials which can get even the toughest stains out. The traditional method of cleaning an oriental rug involved hanging the rug and shaking and beating it to get the dust out of it. Professional rug cleaners in Philadelphia don’t do that anymore rather use a more gentle method for cleaning the rugs. This makes sure that the rug is not damaged during the cleaning and still maintains its integrity. Professional cleaning also helps avoid a risk of buckling and shrinkage of the rug due to excess water used. 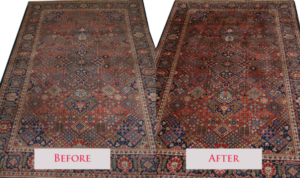 Proper care and regular cleaning can make oriental rugs last for a very long time. Getting it professionally cleaned ensures that your oriental rug is getting the necessary care, is clean and sanitized. Free of soil, allergens, and infestations. Also if your rug gets damaged the expert will be able to help you repair and restore it to its former glory as well.